Over the past couple of years I've noticed that more and more of our customers have been talking about or considering using Shopify e-commerce software. I've no doubt this is because Shopify has become one of the fastest growing and most attractive cart platforms around. Better yet, it's a homegrown solution built by Canadians and supported by Canadians right in our capital city of Ottawa. The folks at Shopify were kind enough to give us an unrestricted account to put the software through the gears and try it out for ourselves. After a solid day of playing and tinkering with Shopify I can see why it's become such a popular e-commerce platform. 1) They wanted to make it easy to use. 2)	They wanted to build a platform that actually helped their customers to succeed online. Immediately upon logging in, you will see that this is a well thought out, mature e-commerce software package that is targeted primarily at small and midsize businesses. That's not to say that it wouldn't be a fit for larger businesses, but its ease-of-use and out-of-the-box functionality is likely to make it a winner for small and midsize businesses. Shopify is a completely web based shopping cart system, with all of the setup and day to day administration being done right within the web browser. There is no need to download or install any additional software. At this point I should point out that one of the classic problems facing shopping cart software developers -- in order to offer a robust and fully featured software package, you must build in a complex and powerful feature set. For example, you need to have a product database, categories, tax logic, shipping logic, currencies, images, inventory tracking, order management, item search functionality -I could go on and on. The problem, of course, is how to deliver all this advanced functionality while at the same time making it digestible and easy to use. This is doubly true if your software will be used by users that are not technically proficient in web development and have not ever worked with an e-commerce store before. Shopify has come up with a simple yet elegant solution. The second you login to your Shopify account you are immediately greeted with a message which explains that there are seven steps to complete in order to launch your online store. Even the screen layout and page interface itself is optimized in such a way as to help you learn and become familiar with administration as quickly as possible. (This is always one of the biggest challenges when learning new software). Upon starting, you will be immediately prompted by an on screen tutor to begin step one, which is building your catalog via the "Products Page". However, when you click on the hyperlink that the tutor provides it doesn't take you straight to the Products Page. Instead, if shows you via a pop-up arrow on screen where in the menu interface you must click in order to go to the Products Page. By doing this it immediately starts teaching you where the most critical components of the software are located, and how to navigate the administration panel. This has been very well thought out because if it had taken you straight to the Products Page you might not have been able to find your way back there once you've completed the setup wizard. As far as the process of following each of the seven setup steps go, you can't get it wrong because the setup wizard won't let you. Although there is a recommended order in terms of which steps to complete in which order, you don't have to follow it. You can build the store in any order you choose, and Shopify will help you keep track of the remaining steps you have to complete before getting your store live. As you are working you will see a footer at the bottom of each page that says "I've completed this step". As you complete each part of the seven step process you simply click this box and Shopify pushes you along to the next necessary task in order to complete and publish your online store. The fact that the order of the seven setup steps can be changed is especially helpful because not everyone can complete all seven steps in the same order. For example, you might want to customize the look and feel of the store, but you haven't finalized the pricing of your products yet so you can't begin building your product catalog. Shopify has developed the system in such a way that you can complete the steps in any order that you want, and you are always left with a clear understanding of what steps remain to be completed. I began with the recommended first setup step, which is adding products via the Product Page. As soon as you arrive at the Products Page you are given the choice of adding a product, or importing an existing product database. I decided to begin with importing products, because many existing merchants who are considering switching to Shopify will want to import their existing database as opposed to re-keying all their product details. Importing (and exporting for data backup) is fully supported by Shopify and easy to accomplish. A sample CSV (comma separated) data file is provided to show you the field mapping when importing product information. Some of the values in the CSV file were obvious (title, vendor, type, price) whereas others will take a big of digging to understand (variant inventory tracker, variant fulfillment service). Importing database information can save hundreds of hours of work for merchants with a big catalog. Many merchants won't be importing product information and will instead key the info directly into Shopify. Adding products from scratch is refreshingly easy to do. The process of adding a product to a catalog is all done within a single page. This is important because keying product data is something that merchants tend to under estimate in terms of the amount of time required. The faster and easier it is to do, the better. Within the "Add Product" wizard you find options for both basic and advanced users. The product description field uses a Microsoft Word like interface that lets you type in the description and control the font style, size and text alignment. It gives a good degree of control over the formatting of the way the product description is displayed. For advanced webmasters Shopify has included a control tab that will let you "View HTML". If you choose this option the GUI is eliminated and you are instead given direct access edit the pure code. This will appeal to webmasters that prefer to code the look and feel of the product description in pure HTML and CSS (which provides a bit more granular control for advanced users). You are also able to put inline images and even embed flash, video and other custom scripting within the product description itself. This will give designers the ability to create unrestricted page designs, and savvy marketers the ability to implement a compelling call to action or utilize other tricks of the trade within the product description. As a side note, the product page defaults to Canadian currency so all pricing listed for products are listed in CAD. Merchants targeting international customers can easily change the payment currency setting within the administrative "Preferences" menu. When it comes to designing the look and feel of your store, Shopify uses a template based system called "Themes". My first impression within Shopify was that there were only two free theme choices. I came to this conclusion because under Themes I only had two default choices to choose from. However, there is a "Theme Store" where you go to find more themes (both free and paid) . After navigating to the "Free" themes area I was able to find about 25 additional free themes. They were all very nicely designed and looked current and professional by any measure. In addition to the free templates, there are dozens of professionally designed themes that you can purchase. The average price for a 3rd party theme seemed to be about $125. The 25 free themes were so nice that unless there is a specific design requirement most users will likely find the free themes to be more than sufficient. After choosing a theme that I was happy with, I wanted to get in and customize it further. While modern shopping carts such as Shopify make it easy to launch a website with a beautiful and professional design right out of the box, I still feel it's important to be able to customize the look and feel further to match the brand and sales message of the company. Customization of the theme is either easy or challenging, depending on your level of technical proficiency and patience to learn the various components that come together to create an overall theme. Within "Theme Settings" you will find a very easy to use GUI where you are able to control design elements such as fonts, logo, background images, hyperlink colors, etc. Digging in deeper and more intrusive editing of the page layout is where it gets a bit more complicated. This is done within the "Template Editor". The editor will seem a bit confusing at first glance because themes are somewhat complicated (being broken down into multiple modules for each different element of the overall design of the website). For example, if you wanted to change the alignment of the logo on the home page, you would have to figure out which theme sub-section the is the one that displays the logo. Once you've figured out which part to edit it's actually quite easy to do. Please be aware that this is a necessary evil of a template driven shopping cart system. At some point you have to make a choice - either you are going to design and build your own website and shopping cart system from scratch (in which case 99% of web users would not be able to achieve a result near to as professional looking as that of a Shopify theme), or you are going to use a template driven cart like Shopify. Editing a theme has a bit of a learning curve to it, but it's still faster than building and coding your own design from scratch. In other words, although it may be a bit confusing at first to edit a theme, once you wrap your head around it the process it becomes much easier. You will be able to edit and customize your design in almost any way you might want- so long as you are willing show a bit of patience and put in the time to learn and understand the theme system. Once you get the hang of you will be able to go in and quickly modify your design with scalpel like accuracy. Once you've created a page, editing the navigation menus (in order to link to the new pages that you've created within Shopify) is very easy. Within the "Navigation" administrative menu you have full control over both the header and footer navigation menus. This makes it very easy to quickly add new content and control and direct visitor navigation. Using Shopify as a CMS would not be sensible for a large business because it's functionality is mostly limited to creating simple static HTML pages. However, for small businesses - especially those without a dedicated web master - Shopify could be a very good solution to build a complete online web presence using the tools provided. One of the seven setup steps involves configuring your payment options. This is where you would configure your Shopfiy account to use your desired credit card processor (or Paypal). Configuring your payment options is an easy process. You pick the name of your payment gateway from a list provided in a drop down box. Once you've selected your gateway it will prompt you for your user ID and password of your account with the gateway. You are then given the choice to do pre-authorized sales (where funds are reserved but not captured) or full authorizations (where the customers card is billed in full as soon as a purchase is done online). This is the only step required to configure your Shopify store to accept Visa and MasterCard payments. There are a few additional options on the payment customization page. Within this page are additional settings to control the creation of email marketing lists, sending of order notifications, and you can also add any custom scripts (such as google Analytics so you can track conversions from your order confirmation page). There was one more setting on this page that I was happy to see. There was a setting called "Customer Accounts" which was disabled. A "Customer Account" refers to when someone is surfing a website, has added products to their cart, and wants to checkout and complete the sale, but are forced to register at the store before they can purchase. (The user must create a username, password, and confirm their email address). This was popular a few years ago (osCommerce defaulted to this). I suppose the concept behind this was that it would allow a merchant to collect customer information for followup if they should click-off, but there are better and less intrusive ways of doing this. What this really does is say "Hi potential customer, before I let you purchase from my store please jump through a few hoops and complete this intrusive account creation step". The next step is to configure the taxes for your store. With ever changing tax laws being applied to e-commerce transactions, it is good to have a system with a reasonable degree of flexibility when it comes to tax logic. Shopify allows you to break down taxes by country, and region within that country (states/provinces). With Shopify being a Canadian based company, setting Canadian taxes was extremely easy. Tax rates are set using a simple drop down box type interface where you are able to select and set (on a per province basis) the amount of GST or HST to charge. Setting tax rates for destinations in the US or international territories is just as easy. As far as shipping logic goes Shopify provides several different options to choose from. Shopify has functionality built into the software to support real time shipping quotes from Canada Post, FedEx, UPS and USPS. In addition to the real time shipping calculations you can set weight based shipping logic (where each item in the catalog is assigned a weight that is used to determine the shipping cost), or price based shipping (where shipping fees are calculated as a percentage of the overall order subtotal). Finally, you can use any combination of the above to achieve more complicated shipping logic. Most users will likely be satisfied with any one of the above three options. The last step is to configure the domain name for your store. This is another stage in which the administrator is given a choice. Shopify allows you to redirect from your main website and host just the store / catalog portion of your website. In order to do this you would create a subdomain with Shopify (such as http://store.yourwebsite.com). Alternately, you can host your entire website with Shopify. Because the software includes CMS functionality this will be a popular choice for small business owners that are looking to build their entire website (including the static HTML and informational pages) within Shopify. Getting orders is only half the challenge. When a customer pays you, they expect to receive what was promised! Shopify offers a multitude of order notification and delivery / order fulfillment options. The software has built-in support to tie into popular fulfillment companies. Using this the system will send out order notifications to the ware house for pick/pack/ship. Most folks won't use this, and will instead be shipping their own orders. The order tracking system has a straight forward interface. Orders can be viewed online, and can be searched by a number of transaction criteria. The orders can also be exported in CSV format for import into any spreadsheet, accounting or order management software. Every company has it's own post-transaction order fulfillment process, and the folks at Shopify appear to have realized this and built a system that can be adapted to integrate seamlessly into most businesses with little hassle. I didn't notice any specific features within Shopify related to SEO, but that doesn't mean that it's not search engine friendly. In fact, most "SEO" features of shopping carts are simply directory submission engines and other fluff that doesn't really make a difference. The most important aspect of good search engine optimization is that the content of a website must be easy to spider, and found relevant by Google and other search engines. In this department Shopify does quite well. The URL structure of a Shopify store is specifically generated to appear static looking (without long query strings) and will be easily spiderable by Google. Furthermore, Shopify takes the product name and keywords for each product and includes them in the URL of each product page. This is an extremely desirable tactic that will help boost relevancy within the search engine. A webmaster with a good knowledge of SEO should be comfortable working within the framework that Shopify provides, and should be able to achieve a reasonably good result. I didn't notice anything that Shopify did that would be a detriment to the ability achieve a good result in the search engines, although I didn't notice the ability to create custom TITLE and mega tags for granular control over these elements on the page, which is something that some advanced webmasters may desire from a SEO point of view. Shopify is a Canadian company with folks on the ground in Canada and all support being delivered from in-house in Ottawa. Coming from Merchant Accounts.ca (where we operate the same way) we consider this to be of considerable value. Too many companies these days seem to be taking automation a step too far, with offshore call-center based support, or even email-only based support. Getting a knowledgeable person on the phone, quickly and easily is something that is often far too undervalued - until the moment arrives when it's actually needed. The first time I called Shopify I was immediately connected to a representative, without a hold queue. This person was located in my local time zone and was able to directly and knowledgeably answer my questions about the cart. For that reason I am willing to give Shopify a better than average score in the support department. While Shopify is not an open source system, they have cleverly created an app-store where 3rd party developers can build custom modules to extend the functionality of the software. While I didn't spend a great deal of time with any 3rd party apps, I can say that the app store had a wide range of offerings such as live chat systems, analytics, customer satisfaction surveys and many add-ons related to operating an online store. An active developer community is always a good sign, and Shopify seems to have a thriving app store with lots of functionality that webmasters and business owners will find useful. At this time Shopify does not have native multi-currency support, but clients are able to setup multiple cloned stores (one for each payment currency they wish to support) in order to support international multi-currency payments. Customers are given a discount for multiple stores in the event that multi-currency processing is required. Being a remotely hosted cart solution, Shopify has a subscription model for the software. The price point of a subscription is determined by how many products are in the catalog. The monthly subscription fee starts at $29 USD per month for 100 products and goes up to $179 per month for an unlimited number. Most businesses would be satisfied with the $29/month or $59/month (for 2,500 products) options. A very important additional note - while there are no bandwidth related charges, Shopify does collect an additional per transaction fee for each sale made of either 1% or 2% depending on which program you have selected. (Merchants on the Unlimited program are not charged this fee). While I cannot fault Shopify for building a business model that includes revenue based on a merchants sales activity, I should point out that this is non-standard in the industry. Shopping cart software usually carries either a one time setup fee, or a monthly subscription fee, and occasionally even a fee for support. However, it is not normal for the shopping cart provider to dip their fingers into a merchants sales revenue. With that having been said, Shopify offers an Unlimited program where this fee does not apply. My personal feeling is that the percentage based transaction fee is reasonable so long as a merchant is realizing a benefit that they would not realize if utilizing another shopping cart software. 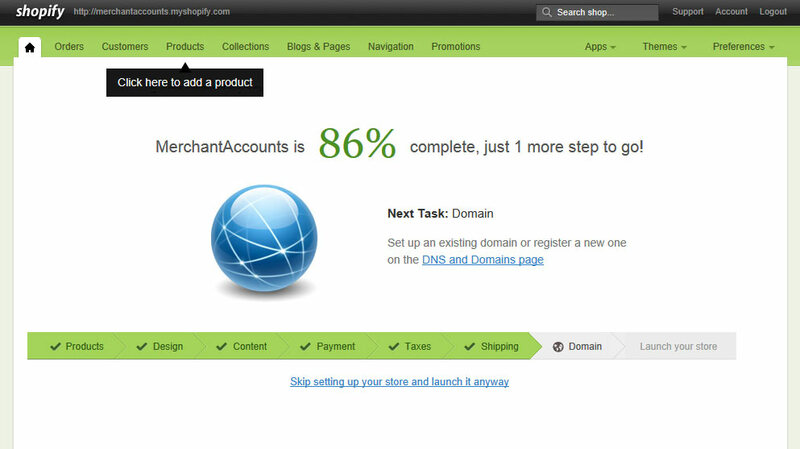 With Shopify you are paying for support and ease of use. An argument can be made that by using Shopify a merchant may get live much quicker and easier (and possibly achieve a higher degree of success because of the professionally designed themes) than they would achieve with another shopping cart solution. In other words, you will have to try the demo out, compare it to other carts, and decide for yourself if the additional 1% or 2% per transaction is worth it. I suspect that for small and mid-sized merchants this could be a value worth the extra cost. Update: After providing this feedback Shopify contacted me and asked for a chance to explain the billing model from their point of view. I felt this to be a very reasonable request which I was happy to accommodate. They make the argument that whereas other hosted shopping cart solutions charge for bandwidth they do not. Building upon this they point out that as a store goes through growth the savings on bandwidth charges should be considered against the 1% or 2% additional charge for each sale made. I can see the validity of this point. It is purely the size of the merchant that would determine if savings on hosting bandwidth would stack up favorably against the 1% or 2% per sale surcharge. For large and popular online stores the bandwidth savings could work out overwhelmingly in favor of the merchant. For smaller merchants the savings on bandwidth charges would never factor into a significant number. Shopify does target smaller businesses, so I am a little bit skeptical of bandwidth savings being realized by a majority of merchants utilizing the service when compared against the per transaction surcharge. Both the validity of their argument regarding bandwidth is true, and the validity of my concern about the likelihood of small merchants realizing a savings on bandwidth is true as well. In the end, it still comes down to the merchant themselves. You must decide for yourself if there is value in using Shopify, and I expect many merchants will find that yes there is significant value. I have one final thought to deliver in regards to the Shopify billing model. If Shopify is providing unlimited bandwidth as a selling feature for the service, they should also provide unlimited hosting storage space for images and videos (within reason). Server space is relatively cheap and this should be fairly easy to implement. After all, Shopify is a premium service and should not tie a merchants hands in any way from delivering any content necessary to realize a sale. (This is especially true if the unlimited bandwidth aspect of the service is part of the unique proposition that offsets some of the cost from the 1% or 2% surcharge per sale.) I wouldn't be altogether surprised if at some point in the future Shopify goes the whole nine yards and commits to unlimited server space in addition to unlimited bandwidth. One last note on pricing: although Shopify is a Canadian company all pricing on their website was advertised in USD. We can't fault them for this because the USD is the world's global currency. However, it would have been nice nod to Canadians to have a drop down box (or some other option) to see pricing in listed in CAD for Canadian customers. I'd been hearing good things about Shopify for a long time before doing this review. That set the bar quite high in my mind as to what to expect when doing the review. I expected the software to be very easy to use, and I expected support to be excellent. Shopify delivered on both of these points. I hoped to see a storefront that was clean, easy to use, and had a modern web 2.0 design. Shopify delivered on these points as well. If I had to find points to nitpick about I could find them. For example, Shopify is a big piece of software, and was extremely well laid out, but there could perhaps have been some tutorial videos that popped up on the screen when I first logged in. Then again, tutorial videos weren't necessary because the software is so easy to use. On this point, before leveling any criticisms I must remind myself of a classic software mistake -- don't assume that more features and options automatically make something "better". With that in mind I can't find much to fault with Shopify because what it does, it does very well. Coming from an e-commerce and merchant acquiring background, the only criticism I might point out is that Shopify is imposing a per transaction based fee in addition to the monthly subscription fee. However, as I discussed above, the fee is arguably quite reasonable when considering the success a merchant may achieve by leveraging the cart and the excellent support that is provided with it. Shopify won't be for every user. Folks who like to dig through code and have absolute 100% control will not find Shopify to be the right choice for them. Then again, Shopify isn't meant for that type of user. (For that matter, no remotely hosted cart is). Shopify is meant for people who want a tool that will help them build an effective, attractive, modern online store on a reasonably small budget, without having to compromise on functionality. It's a particularly good solution for business owners that don't have a high degree of technical expertise and don't have dedicated technical staff to help them out. I very much want to emphasize how important support is for small and mid-sized business when building an e-commerce presence, and how greatly Shopify succeeded in this department. Shopify will get a recommendation from me, and will be joining my list of personally recommended carts which can be found at: www.mercant-accounts.ca/shopcart.htm. Shopify have graciously offered our customers a 10% discount on the regular monthly fee. This is a nice incentive for an already very attractive shopping cart solution. If any of our clients would like to receive this discount just contact Merchant Accounts.ca support and we will have an account manager at Shopify make sure the applicable discount is applied. support@merchant-accounts.ca / 888-414-7111 ext 5.